The discography of American rock band Bon Jovi consists of eleven studio albums, three compilation albums, one live album, one box set, thirteen video releases and over 50 singles. This list does not include solo material of Jon Bon Jovi, Richie Sambora and David Bryan. Bon Jovi's first commercial release was the single "Runaway" in 1983. It was taken from their 1984 self-titled debut album Bon Jovi which made a small impact in the US. Their second album 7800° Fahrenheit achieved even less success than it's predecessor, except in Japan where it reached the top 5 on the album charts. The band's first major success came with the release of their third studio album Slippery When Wet. Released in 1986, the album became Bon Jovi's best-selling album worldwide selling over 25 million copies.. It reached number one in Australia, Canada and US where it spent 94 weeks in the Billboard 200 album chart, reaching 12× platinum status. The first two singles from the album, "You Give Love a Bad Name" and "Livin' on a Prayer", both reached number one on the Billboard Hot 100 singles chart. The follow up album to Slippery When Wet was New Jersey which shared similar global success. The album produced five top 10 hits on the Billboard Hot 100 giving Bon Jovi the record for the most top 10 singles spawned by a rock album. Two of the hits, "Bad Medicine" and "I'll Be There for You", managed to reach number one. Bon Jovi's fifth studio album Keep the Faith released in 1992 marked a change in the band's sound. The album proved to be a success, especially in Europe and Australia where it reached number one. It produced the top 10 hit "Bed of Roses" while the title track hit number one on the Mainstream Rock Tracks. In 1994, Bon Jovi released a 'greatest hits' album titled Cross Road, with two new tracks. 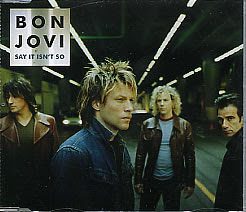 The first single off the compilation, "Always", spent six months on the top 10 of the Billboard Hot 100, certified platinum in the United States and became Bon Jovi's highest selling single. The compilation album would be the last release to feature bass player Alec John Such. Despite the departure of Such, the band released their sixth studio album, These Days, a year later in 1995. The album fared better internationally than in the United States, but still managed to reach Platinum status by the RIAA. Following the tour of the album, the members of the band went their separate ways. Bon Jovi regrouped in 2000 and released their seventh studio album Crush. Despite a nearly 5 year hiatus, the album was just as successful as their previous releases. It became the band's fifth and fourth consecutive number one album in Australia and UK respectively and reached double platinum in the United States. The success of the album was largely due to the lead single "It's My Life" which was nominated for a Grammy Award for Best Rock Performance by a Duo or Group while the album itself was nominated for Best Rock Album. The band soon returned with an eighth studio effort in 2002, Bounce. It debuted at number two on the Billboard 200, making it Bon Jovi's highest debut in the band's 20 year history. This record was beaten however with the band's ninth studio album Have a Nice Day in 2005. The title track was an international hit reaching the top 10 in Australia, Europe and UK. Another track, "Who Says You Can't Go Home", reached number one on the US Billboard Hot Country Songs after being remixed into a country duet with Jennifer Nettles. The duet earned Bon Jovi a Grammy Award for Best Country Collaboration with Vocals. The single gaveway to the band's tenth studio album in 2007, Lost Highway, which was a Nashville-influenced record. The album became the first Bon Jovi album to debut at number one in the United States, making it the band's first number one album in their home-country since the late eighties. Although the album achieved great success, winning them a Grammy nomination for best Pop Vocal Album, the band returned to their rock roots in 2009 with their eleventh studio album The Circle. The album also debuted at number one on the Billboard Hot 100, making it the band's fourth number one album in the United States. The lead singles from both Lost Highway and The Circle received Grammy Award nominations for Pop Performance by a Duo or Group with Vocal. The lead singles were "(You Want to) Make a Memory" and "We Weren't Born to Follow", respectively. As of February 2010, Bon Jovi has sold more than 120 million records worldwide. Alec John Such – bass, backing vocals (1983–94). Alec made one live appearence in 2001 with Bon Jovi since his departure, in Giant Stadium for the song Wanted Dead or Alive.